This was a really strange book. The tone is dark and so is the subject matter, particularly for a YA book. 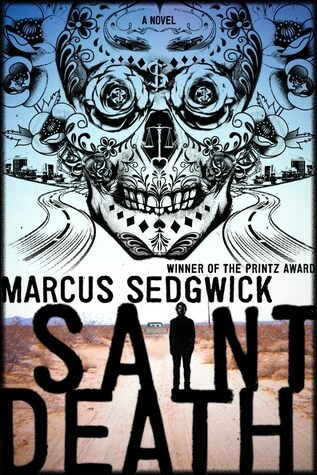 It explores the world of Mexican immigrants, as well as a dark, spiritual world of guns, gangsters, violence, gods, and money. Arturo is a young man living in the border of the U.S./Mexico in a shack, working for scraps at a garage and hustling card games for quick cash. Enter Faustino, a childhood friend who Arturo hasn’t seen in years who urgently needs Arturo’s assistance to get his girlfriend and their child across the border to a smuggler, who is to facilitate their illegal entry to the U.S. Together the two pray to Santa Muerte (Saint Death), and make a plan to go after some dangerous men for the money they need. Of course not everything goes according to plan and they run afoul of some gangsters in the process, and of course, there are consequences to pay. I didn’t really like this story. It’s all over the place with the immigration plot, the supernatural elements of Santa Muerte, the narco stuff, and a couple of other subplots that I could go on and on about. I understand that the author is going for a modern retelling of the Faustian legend (if you missed it, one of the main character’s names is literally Spanish for “Faust”), but Arturo and his friend were never characters that I completely understood or related to. The action was too slow in coming and when it did come, I actually found myself skipping pages. Interspersed throughout the story were also informational factoids about NAFTA and borders and U.S. corporations, all of which could have been edited out for clarity and none of which seemed to match the tone of the story. Even though I didn’t like this one, I don’t think I would rule out this author’s work in the future.